I’ve always been a spender. I became a couponer out of necessity back in 2011, and frankly I think I was equally excited about saving money as I was about getting to buy lots of stuff. In the last two years, my spending has gotten out of control. While writing a frugal lifestyle blog. I was living a secret double-life. Its part of the reason why I haven’t been blogging much. I feel like a fraud. How can I possibly teach people how to be better about managing their money when I can’t even manage my own? I had a real “come to Jesus” moment when my amazing husband approached me with his concerns. Again. For the millionth time. This time at the end of his rope. This time something MUST be done. I didn’t want to destroy my marriage so I knew something had to change immediately before I did irreparable harm. Even though I work from home as both a blogger and a virtual assistant, I couldn’t find the time motivation to cook dinners in the evening. That meant eating out WAY more than we should be. While I was out shopping, I would grab lunch on the go. We live out in the boonies, so it was always just more convenient to grab something for lunch than to trudge home and make something (by which point I would be starving). Two years ago, my husband was offered a job (by a miracle set of circumstances) in Oregon. We lived in Minnesota at the time, and had been married about two months. In two weeks time, we packed up everything we owned, and drove to Oregon to start our new life. My husband had grown up in Oregon and didn’t like it (he hates the rain!) so we decided immediately it would be a “temporary” move for no more than 2-4 years. We figured that would be enough time for him to get the experience at this new job that would be a stepping stone to better opportunities. Due to that decision, and the fact that I am now self-employed, I have made zero effort thus far to meet any friends in the area. I figured, why bother when we would only be here a couple of years. I didn’t realize just how long a couple of years is. The loneliness hit me HARD. It was compounded by the depression/anxiety from the miscarriage I suffered in November of last year. To make matters worse, my husband works in a tiny office where everyone is at least 20 years older than him, so we don’t really hang out with anyone there either. We also share a car now to cut down on expenses, so I only get out of the house a couple times a week. What is there to do when you have no one to hang out with? Its not like I bought expensive designer clothes or anything. Far from it. In fact, 99% of the money I spent went to two places: fast food, and thrift stores. I was buying so much JUNK we didn’t need-just because of the “cheap” thrill of having something new. I bought stuff I was going to “fix up” or “upcycle”. I convinced myself and my husband that I would feature all my projects on my blog, and so therefore it was a worthy expense. Except I didn’t. All the stuff is piled up in my garage. Taking up space. I spent literally hundreds of dollars on spray paint for my alleged “projects”. Why? To fill a void that I had created myself by trying to isolate. I didn’t want to make new friends (something that does NOT come easily to me) and then have to move away from them in 2-3 years. Wanna hear the kicker? Because of the financial damage I’ve done I’ve put us further in debt. Now we’re REALLY stuck here. That means now instead of a 2-3 year exit strategy (we are at the end of year 2) we are looking at AT LEAST another 2-3 years before we can afford to move somewhere else. I have no one to blame but myself-and I know I need to make some MAJOR changes. In the last few weeks, I’ve been working on a strategy to help cut my spending habits. These are habits I believe will help carve out as much money as possible to catch us up on our bills, put away an emergency fund, and help restore the damage I’ve done to myself and my marriage. FINISH the projects I’ve started (or have yet to start) and actually feature them on the blog. Return to meal planning based on sales, make home cooked meals and freezer cooking. Cook extra each night to freeze for my husband’s future lunches. Start thinking of my “new” home state as a HOME rather than a countdown to when we can leave. 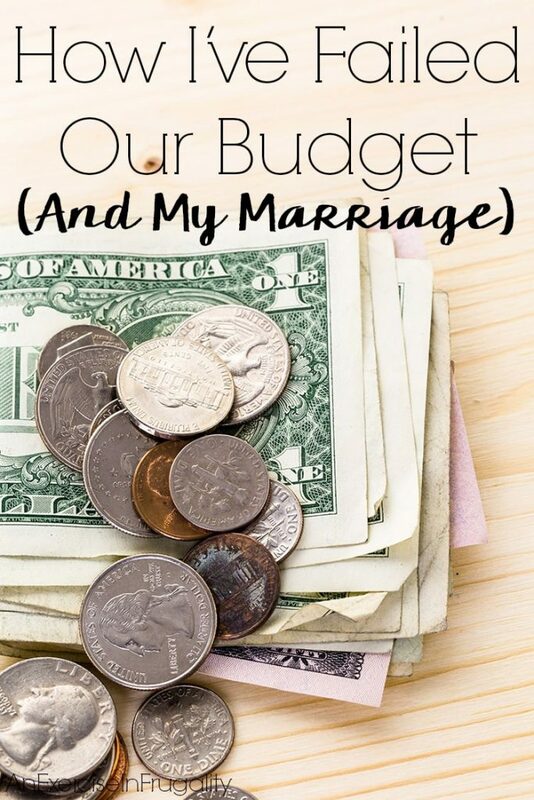 Create a new budget and stick to it! Why am I sharing this with a bunch of strangers on the internet? Because I’m hoping that someone might find this,either now, or some time in the future, who finds him or her self in a similar situation and know that they are not alone. Maybe YOU need a little advice or encouragement from someone who has been there. What’s embarrassing for me is that I know what I need to be doing. I’ve done it before. I’ve taught people how to do it. I’m just not doing it myself. I’ve let our situation–between the devastating loss of our first pregnancy together, to living in a place where we don’t know a soul–drag me into a pit of despair. I’ve let it ruin my desire to have a life worth living. Well I’ve finally decided that I want my life back, and I want to make it better than ever. It won’t be perfect, life never is, but that’s what makes it interesting. And I would love it if YOU would join me on this journey. I just wanted to come clean about what’s been going on with me, why I haven’t been blogging much…and why you’re going to be hearing a lot more from me as I tackle my financial troubles head-on. I would love to hear your struggles and successes with a similar journey. I hope to not only share my knowledge along the way, but also to inspire you to take control of your financial situation before it’s too late. What is YOUR biggest financial hurdle? My biggest hurdle is that I don’t even look at prices before I buy something. If I need it, I buy it. Thank you for sharing your story. We work hard to live on mostly one income in a very pricy area. Blogging income is so unpredictable its really hard to budget for! We are mostly a single-income family as a result. One of my biggest finical hurdles is eating fast food. I know I would be able to save a substantial amount of money if I would cook at home. Yes! Its so hard when the drive thru is so convenient, especially if you’re out running around and you’re too famished to wait till you get home. Its definitely one way I waste a lot of money! Good for you! I think you are making a very brave decision and making some big changes in a good direction. If you might find it helpful, my blog AdriansCrazyLife.com has plenty of posts regarding both decluttering and managing your finances. You might find a tip or two that might help you. I look forward to hearing more about your progress – I’m in your Tribe over at Triberr. Thank you so much Adrian! I will definitely be checking your blog out for tips and I look forward to seeing more of your stuff on Triberr! 99 cents stores. I buy way to much junk at them and think It’s ok. I have to remind myself that 50 bucks spent at Dollar Tree is still 50 bucks! Just because I got more stuff for the money doesn’t always make it ok! I hear you! I stopped couponing for the same reason. Coupons do not save you money, they REDUCE the amount that you would have SPENT. I still use coupons, and I still shop because I have said coupons, it is a constant battle. Good luck lady! Join some Facebook groups about getting out of debt. I am on 3-4 and I talk with them when I need to confess or get motivation. Email me if you want the names of the groups. You are an inspiration, Mrs. Daniels! I cannot believe how far you’ve come in getting rid of your debt. I truly admire it and its something that I aspire to, for real. I will definitely have to hit you up for the names of those groups. I’m in a couple, I just need to be more active in them! Eating properly is also one of our biggest issues. We are always on the run and plan as we may it often doesn’t work out. Thank you! I’m sure as a fellow blogger you totally get it! 🙂 I have piles, its really ridiculous. So many good ideas, not enough money or motivation! haha. Great post. You can do it!! Did Financial Peace University in our Sunday School Class. Debt free except for the house and that will happen by next summer. Thank you Jesus!! As missionaries we travel nearly 50 weeks a year and if we can do it and become (almost) debt, you can too. Wow thank you Brenda! That’s quite an accomplishment especially while traveling so much. I hope to be totally debt free one day as well! This is such a brave and honest post, and the fact that you put it out there shows that you’re ready to change things. Good luck. You can do it! Thank you, Lois! Your comment means a lot to me. I appreciate the encouragement, I definitely need it! It’s going to be a long road, but I am optimistic! Couponing can really be a slippery slope of sorts. It’s so enticing to “save” and make the most of a deal that it’s easy to lose sight of what you are buying and if you even really need it. It sounds like you’re on the right path now! You are absolutely right. When I first started couponing I spent what I saved because I was so excited to be getting a good “deal” that I had to get MORE. Ugh. Thank you though, I appreciate the encouragement! I love shopping, so I know how you feel when it comes to being able to get it under control and have a budget. Coupons and discounts are a life saver! You can do it, it takes patience and practice. Thank you for sharing your story. Right? Shopping is a common Achilles Heel. Its hard to remember that even though you’re getting good deals, its irrelevant if you don’t need it or can’t afford it-no matter HOW good the deal is! Thanks for the encouragement, and thanks for reading! I have a friend who’s daughter is in a similar situation. She eats out every day for lunch and doesn’t realize how much it adds up to be. Its so easy to say “oh its just five or ten bucks” but you are SO right-it does add up fast! Hopefully she’ll realize the error of her ways before it gets her into trouble! I admire that you shared so freely and this will no doubt help a lot of folks. We have a budget and the money we need to save does not get touched and stays in the bank. It was interesting to read your post about what happened with your couponing. I have heard many stories about people who spend more money while couponing because the savings are so incredible. I am glad you were able to put a hold on things and get back in control of your finances. My son and his wife are so frugal. I am supposed to be their role model, but they’ve def. been mine too, esp. in the area of conserving and using all that you can (not wasting). I am a shopper too. I am not the best saver. I have a savings account but eat through that frequently. Blogging income is so hard! I feel like I’m always sabotaging our budget, but it’s a learning process! oh I can so relate to this post!! I used to be fanatical when it came to couponing.. I spent hours cutting coupons and matching deals and running to different stores.. I built up a stockpile that lasted me a whole year.. well actually a little more than a year, seeing as I am still using it.. but it did come in handy when I lost my job and was out of work for a month or so.. Since then I found a new job, doesn’t pay that much but it’s better than nothing.. I never hardly ever have extra money to spend on “things”, but here I am on the computer looking at deals.. oh I wish shipping prices weren’t so high…. lol.. anyways, got one of your emails and was just on here checking out your blog and ran across this post!!! just in the nick of time I would say.. I was fixing to order some things thru yerdle.. I know technically it’s free stuff but you still have to pay shipping and service fees.. and right now I can’t even afford that.. seeing as how I bought a planner and a money making book this payday.. those were my splurges…lol.. oh to win the lottery!!! sigh.. great post.. glad I read it.. you are awesome and I love your writing.. Thanks for the open, honest article! It is EXACTLY what I needed to see today! Since our close neighbors (who we did so much with socially) have moved away in our turnover neighborhood and a husband who travels with his work and hobbies, I also have been feeling that isolation and filling my space with thrift store clutter and PROJECTS I have yet to finish. Thanks for opening the dialogue! Its off to clutterers anonymous for me!